Pain is exhausting…mentally, emotionally, spiritually and certainly physically. It zaps the energy of even the most well-intentioned of mommies. The expression of pain whether objective or perceived, colors the lives of many women worldwide in their daily interactions and reactions. It accounts for gaps in employment, enjoyment of family and independent function at home. Fibromyalgia and other chronic pain disorders, the unseen “disabilities” for so many ebbs and flows in intensity, worsened by stressors and certainly by grief. I know because I’ve suffered with the disorder now coined Fibromyalgia Syndrome (FMS). More common in females, FMS involves the musculoskeletal, genitourinary, gastrointestinal and miscellaneous symptomology. It accounts for 10-20 percent of diagnoses by rheumatologists and is underdiagnosed by general medical practitioners. While dietary and lifestyle changes (exercise, relaxation techniques), along with standard prescribed medications influence the intensity of symptoms, the disorder remains vigilant. While not a progressive disease, its symptoms worsen with age-related decline. Because FMS is “diagnosed” as an umbrella over multiple-related symptoms presentation, treatment modalities must be interdisciplinary. (Remember “The head bone’s connected to the neck bone,” and so on.) Those like myself, who have been both counselor and patient understand the importance of a psychosocial history along with medical documentation. Treating the “whole person” is critical to quality of life. When I think of what has kept me steady since my diagnosis in 2007, it’s my sense of humor. Laughter is perhaps the highest connection one makes with another. It eases tensions during conflict. For pain management, the flow of endorphins (feelings of “happiness”) derived from medical marijuana forms a cycle of better toleration for normal, everyday tasks, say laundry, doing dishes, entertaining others at home, and getting out of the house. And, to “lighten up” physically eases the soul. Doctors are regularly recommending humor as a treatment component for even the most complex of medical maladies. 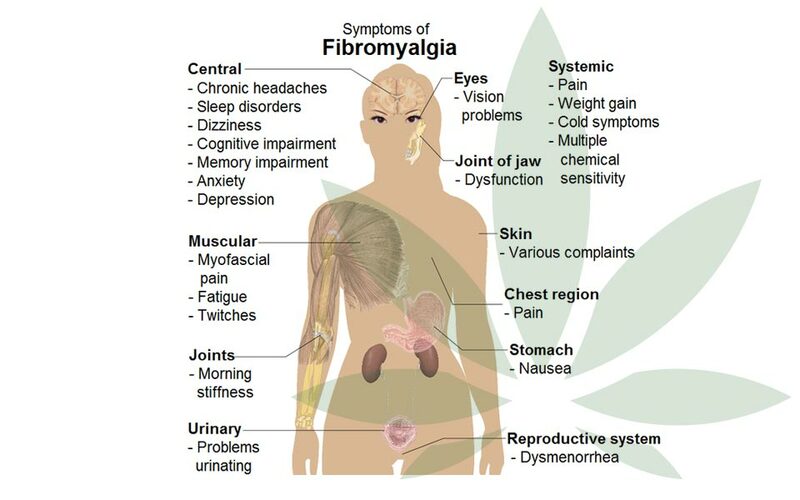 How does medical marijuana factor into the fibromyalgia matrix? Not a doctor but rather a person with FMS, I can firmly say the pain-relieving compounds--coupled with the relaxation of muscles and improved sleep--- are proof enough that medical marijuana has efficacious results. Vaping vs. smoking? Vaping makes me feel there are less damaging effects. The last thing a sufferer of FMS, like myself wants to this incurable syndrome is additional stressors on the body. So far Marinol and Epidiolex are FDA-approved medical marijuana options for use with Alzheimer’s and childhood epilepsy, respectively. We should be encouraged, say experts, in the continued research and the blossoming of the CBD industry. The news continues to be enlighteningly favorable for general use of medical marijuana. For FMS—characterized by “widespread pain” (you’ve seen the commercials) ---this is welcome news. The future looks bright! If you or someone you love suffers from Fibromyalgia Syndrome (FMS), help is around the corner. Finding your compassionate care physician or clinic is easy. Just use this Medical Marijuana Card services search tool to get started. Firdous, J., et al. (2012, May). Fibromyalgia Syndrome: An Overview of Pathophysiology, Diagnosis and Management. Oman Medical Journal, 27(3). Retrieved from https://www.ncbi.nlm.nih.gov/pmc/articles/PMC3394355/. Violet Greene is a mom and wife with a passion for the natural world, naps and song/dance. She practices yoga and stretching regularly. She is a Certified Rehabilitation Counselor for 24 years, a writer of several genres, and an individual contributor to National Marijuana Card Services.